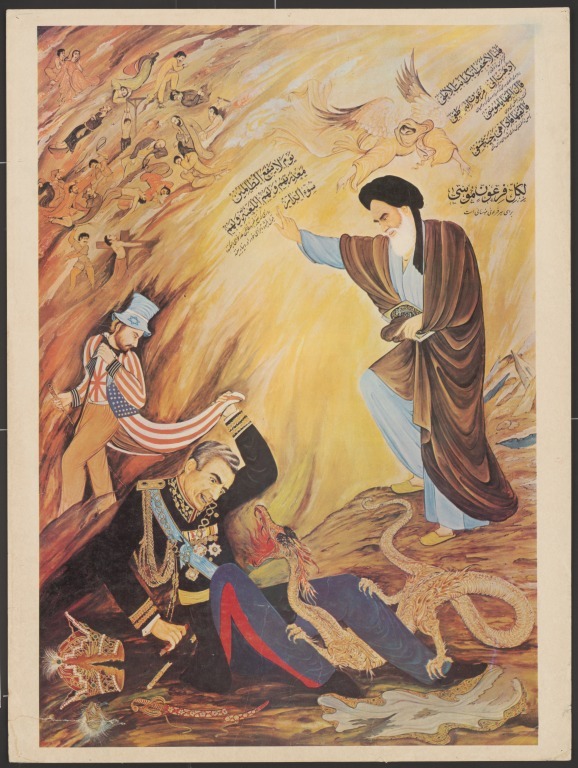 This poster was produced around the time of the Iranian Revolution in 1979. The scene shows Ayatollah Khomeini dismissing Mohammed Reza Pahlavi, the Shah of Iran. In the 1970's Iran witnessed growing calls for social, political and religious change and an end to the rule of the monarchy. Khomeini was a leading Shi'ia Muslim scholar and attracted great support. Influential in advancing the religious character of the revolution, under Khomeini's leadership the country voted in favour of replacing the monarchy with an Islamic Government. Here the Shah is shown hiding under the coat tails of 'Uncle Sam' who is wearing a hat of the flag of Israel. This is a reference to Khomeini's criticism of the Shah's relationship with the United States of America which he accused of helping continue the Shah's reign and Israel, who he perceived as an enemy of Islam. Poster, paper printed with design in coloured ink. The scene shows Khomeini, his arm is raised up, pointing towards a Persian inscription, next to this is an angel in yellow robes. At his feet, the Shah, who is dressed in ceremonial uniform is lying on the ground on his back. A dragon is wrapped around his legs and next to him are his crown and jewelled dagger. With his left arm the Shah is holding onto the coat tails of 'Uncle Sam', who wears a blue top hat with the star of David on and is shown descending into an inferno. Above this scene, in the top left corner people are being tortured: one man is tied to a cross whilst being flagellated by another man, another is hanging by his arms from a gallows. Dr Patricia L. Baker purchased this in Iran in 1998. 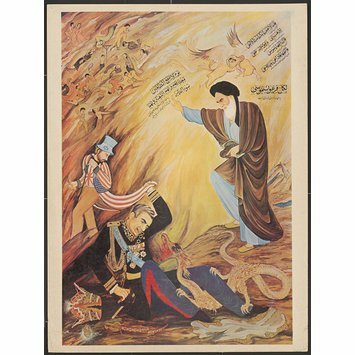 Poster, paper with printed design in coloured ink showing Khomeini defeating the Shah and 'Uncle Sam', Iran, ca. 1979.